Another super easy recipe I want to share today that not only tastes incredible, but requires such little effort. This Spanish Chicken and Potato Roast Recipe is all done in one pot (yay for easy clean-up!). The ingredients are combined in a large baking dish, and then slow roasted in the oven, delivering one heck of a tasty dinner. The potatoes soak up the juices released by the chicken which makes them heavenly moist and tender. And the simple seasonings are all it takes for a fantastic flavor. This hearty, satisfying Spanish Chicken and Potato Roast Recipe will definitely leave you feeling satisfied! Serve with a light salad or steamed veggies for a complete meal. 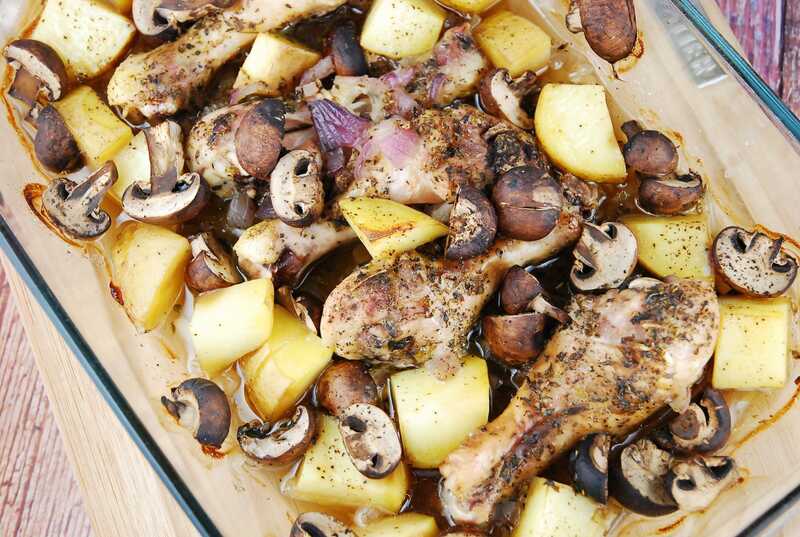 Succulent chicken, potatoes and mushrooms are roasted together in this simple one pot meal. The potatoes soak up the juices of the chicken while it roasts and are oh-so delicious! This makes a super easy weeknight dinner recipes. Preheat oven to 400 degrees. Mist a large baking dish with nonfat cooking spray. Place chicken, potatoes, mushrooms and onions in the dish and squeeze lemon juice all over. Drizzle all the meat and vegetables with the olive oil, then season with oregano, paprika and salt and pepper. Cover with foil, poking a few holes to vent steam, and roast for about 30 minutes. Remove foil, and return to oven until chicken is cooked through and browned on top, and potatoes are tender, about another 12-15 minutes. This looks great. One question though, should the legs be skinless? Thanks! They don’t need to be. I calculated the Points including the chicken skin of each drumstick. This look great and I cannot wait to try it! Question – should the skin be removed from the drumsticks? Also, I bet this would work with thighs as well for similar PP value. Plan to try in the next few days!